One of my favorite gifts of all time for Mothers are Birthstone Jewelry that represent how many children and their birth months! I love how beautiful they are and how unique each one is for each mother! If you are looking for personalized jewelry for your mother this Mother's Day, let me recommend the awesome selection of personalized and custom jewelry from Jewlr.com. They are leading the personalized jewelry movement. You can choose the metal, stones and engravings to create one-of-a-kind, quality jewelry pieces that are manufactured and shipped in a matter of days. While the desire for personalized jewelry is not new, the rapid manufacturing, affordable prices, and ability to instantly preview the item as you build it - is certainly game changing! If your Mom is a bracelet kind of Mom, then I bet she will love Jewlr’s collection of personalized charms! While charms have been among some of the most popular jewelry gifts in recent years, for the first they can now be personalized and engraved. Another hot idea gift idea is a personalized infinity ring from Jewlr. Jewlr’spersonalized infinity rings are trending all over the social sphere. They’re affordable, customizable, and ship out in a matter of days. Infinity rings create the perfect meaningful gift for any occasion, and are available with various stone settings and shapes. However, my favorite, like I mentioned, are the birthstone necklaces! I love the beautiful jewels that represent each month and each child and it is a elegant way for a Mom to show off her pride and joys! 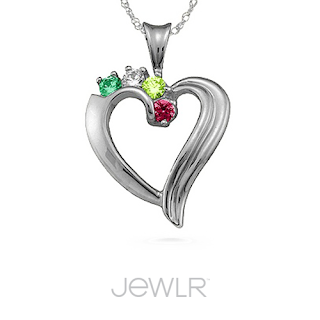 I designed and received this beautiful Elegant 2-6 Stones Mothers Heart Pendant from Jewlr. It was so easy to design this beautiful necklace with the exact gems I wanted and I loved being able to choose from genuine or simulated gems depending on my budget! When I received this necklace, it was as beautiful as it looked online and I loved that it was made with the metal, gem amount and gem type that I wanted to be perfect for my mom! This pendant also comes with a elegant 18" chain. Every mom wants something unique and meaningful for Mother’s Day and personalized jewelry is the answer. Each mom will feel a special connection with her custom made piece, because it was designed by a loved one, with her in mind. It was made specifically for her - and that’s special! Buy It: You can purchase all personalized Jewlr jewelry from Jewlr.com.